Valuation metrics in financials and real estate. This article series provides a monthly dashboard of industries in each sector of the GICS classification. It compares valuation and quality factors relative to their historical averages. Combining 3 valuation ratios, consumer finance and mortgage REITs look slightly undervalued relative to historical averages. 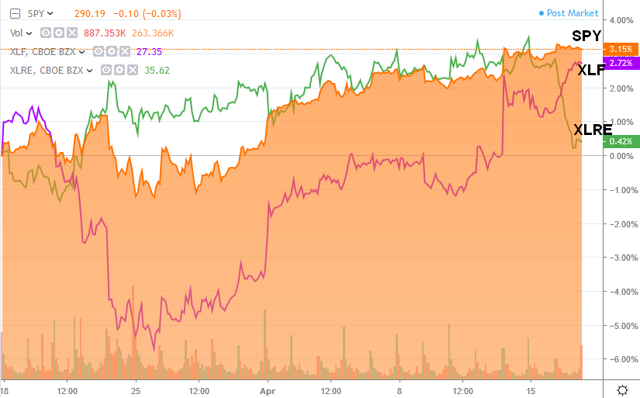 Capital markets look close to fair price. Commercial banks look good in price/earnings, but moderately overpriced taking into account other valuation ratios. Metrics are mixed for real estate management and thrifts/mortgage: some ratios are very good and other ones very bad. All industries in these 2 sectors are above their historical averages in profitability measured in return on equity, except insurance. Insurance is also the most overpriced industry in this group. P/E has improved in insurance and REITs, and deteriorated in real estate management. P/S has improved in banks and thrifts/mortgage, and deteriorated in capital markets, consumer finance, real estate management and REITs. P/FCF has improved in banks, thrifts/mortgage, capital markets and insurance, and deteriorated in consumer finance, real estate management and REITs. 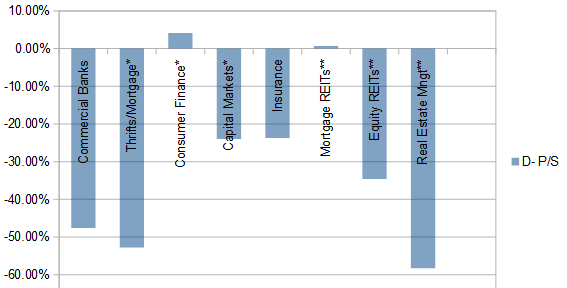 ROE is stable overall and deteriorated a bit in real estate management. The Real Estate Select Sector SPDR ETF (XLRE) and the Financial Select Sector SPDR ETF (XLF) have underperformed the SPDR S&P 500 ETF by 2.7 and 0.4 percentage points. The 5 top momentum stocks on this period in the S&P 500 financial and real estate sectors are: Ameriprise Financial Inc. (AMP), Moody's Corp. (MCO), MSCI Inc. (MSCI), Raymond James Financial Inc. (RJF), and S&P Global Inc. (SPGI), all in the financial markets industry. The stocks listed below are in the S&P 1500 index, cheaper than their respective industry factor for price/earnings, price/sales and price/free cash flow. The 10 companies with the highest return on equity are kept in the final selection. Quantitative Risk & Value Members have an early access to the stock lists before they are published in free-access articles. This is not investment advice. Do your own research before buying. The next chart compares the price action of XLF and XLRE with the benchmark in 1 month.